What sort of Halloween witch are you? Classic, flamboyant or understated? Spooky, sultry, cute or enchanting? Unique Curly Top Wicked Witch Hat displays your own bewitching style! 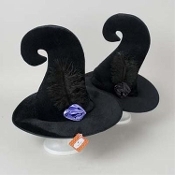 Funky Adult Size Deluxe Uniquely Curled High Top Black Velvety Velour Witch Hat with attached fancy black feather, and choice of black or purple satin flower rose detailing, is the perfect haunting fantasy cosplay costume accessory. This wicked head topper makes just the right elegant evil touch for your next Halloween haunted party or masquerade fancy dress event. *Choice of Black or Purple Satin Rose Flower.